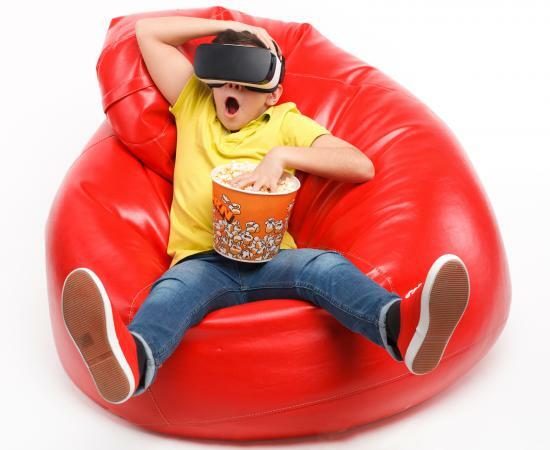 Beanbag chairs are great for kids because they conform to each child's unique body shape, fit in most rooms, look cool and can handle lots of wear and tear. These sacks, filled with small, soft pellets are comfortable to sit or lie in and can be used for laid-back activities like lounging and reading. Bean bag chairs are available in a variety of styles and colors to fit the preferences of every kid. Round bean bag chairs are the classic style seen in the 1970s and 1990s when this type of chair was most popular. This style looks like an oversized doughnut without the hole. Bed Bath & Beyond offers a variety of round bean bag chairs for kids ranging in price from around $30 up to over $100. Different colors are available, as are different sizes and fabrics. The rated bean bags from this retailer are rated highly by customers. Made from durable vinyl fabric reminiscent of the original bean bag chairs, the Ace Bayou Small Vinyl Bean Bag Chair sells for around $35. This circular chair aimed at teens or larger children comes in your choice of red, black or pink. The polystyrene bean filler supports a weight limit of up to 250 pounds. Nearly 60 customer reviews give this chair an average rating of four out of five stars. When kids spend a long time playing video games or watching TV and movies, they want a comfortable place to lounge. Gaming chairs offer the same comfort of a classic bean bag chair with the addition of some head and neck support in the attached backrest. This triangle-shaped bean bag chair features a backrest to help kids sit comfortably in an upright position. Recommended for kids ages 6-12 this simple chair is about 36" wide, 36" deep, and about 4' tall at the highest point. 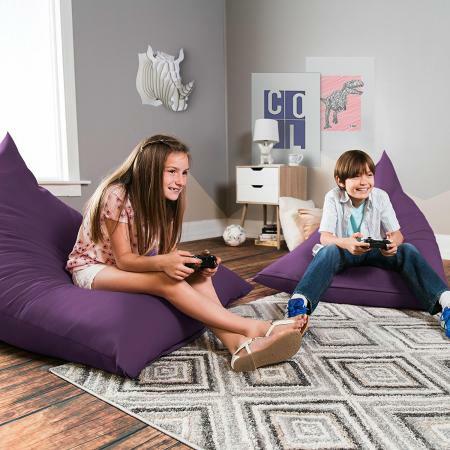 The Pivot Kids Gaming Bean Bag Chair sells from Amazon for around $170 and comes in your choice of dark orange, violet, light blue, dark blue, tan, green or black. Sprogs' High-Back Bean Bag Chair is a basic bean bag chair shaped to include a backrest. Choose the small version for preschoolers and very small children or the large size for bigger, older elementary kids. Color choice is limited to red or blue and each is a bright primary tone. One 5-star customer review from the site where it's sold boasts the "fabric seems durable." This chair is well suited to classrooms or homes where children won't be moving the chair from room to room. A novelty bean bag chair is one that features a unique shape or design element. These chairs may be shaped like animals, sports equipment or even standard living room furniture. For the kid who loves stuffed animals, the Elephant Bean Buddies chair is the ultimate way to snuggle a favorite toy. Shaped like a friendly cartoon elephant, this light gray bean bag chair has a rounded body, large embroidered eyes with a smiling mouth, four flat feet, free-flowing ears, and a full trunk sewn on the front. Made from polystyrene beans and polyester fabric, this cute chair sells for around $35. Other available shapes from Birch Lane Kids are a monkey and a lion. 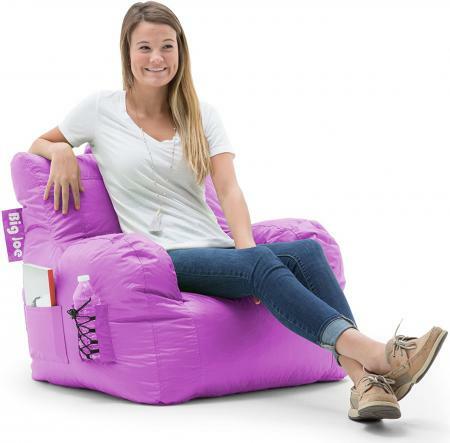 Customers on the site rave the chair is "cute and comfortable..."
One of the few bean bags that resembles an actual chair, the Dorm chair by Big Joe looks like a standard armchair at first glance. Complete with a fully formed backrest and arm rests, this stylish chair even has a cup and magazine holder pocket sewn onto the side. The chair is filled with UltimaX Beans polystyrene. For around $50 you choose from black, red, purple, blue, green and zebra stripe. This modern take on the bean bag chair was featured in a 2017 Top 10 Bean Bag Chairs list because of its durable construction. While it may seem like a simple purchase, finding the right bean bag chair for your child and room size can be a challenge. Talk with your child about what features are most important to him. Combine those requests with your own preferences then look for chairs that fit. How big is the space where you'll keep the chair? Can the chair be washed easily? Will it last a long time for your child? For example, are the materials high quality? Will your child like the design and size for a long time? Kids bean bag chairs come in nearly every style or color you can imagine. Give your kids a special seat that can be carried from room to room when you buy a bean bag chair.